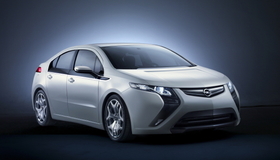 The program includes plug-in hybrids such as the Ampera from Opel/Vauxhall. The British government will give up to 5,000 pounds ($7,668) to anyone who buys an "ultra-low carbon" car starting next year, the Department of Transport said on Thursday. The Plug-in Car Grant of 25 percent toward the purchase price, capped at 5,000 pounds, will be available across Britain for both private and fleet buyers starting January 2011, by which time a range of eligible vehicles should be on sale. Only battery electric, plug-in hybrids with CO2 emissions of less than 75 grams per kilometer and hydrogen fuel cell cars will be eligible for part of the 230 million pound total fund. The electric vehicles must have a range of at least 70 miles (113km) while hybrids must be able to run for at least 10 miles without using fuel, and all vehicles must be able to go faster than 60 miles per hour. Norwegian electric car maker Think welcomed the news. “We are delighted to see the UK moving more quickly to catch up to the leading European countries in the rollout of electric vehicles. These new incentives will significantly increase our focus on the UK market,” Think CEO Richard Canny said in an e-mail reply to questions. French already offers a 5,000 euro ($6,775) subsidy to people who buy electric cars. European production of the Think City full-electric minicar is underway in Finland where it is built by contract manufacturer Valmet Automotive, which also assembles the Porsche Boxster and Cayman. Think sales are underway in Denmark, the Netherlands, Norway, Spain, Sweden and it closed a distribution deal in Austria on Wednesday. Mitsubishi is another automaker poised to benefit from the UK subsidy. The Japanese automaker is running a trial in the UK with 25 units of it i-MiEV electric car. Mitsubishi says it will start producing left-hand and right-hand-drive versions of the i-MiEV for Europe in October and aims to launch in Europe in late 2010 to early 2011. A Nissan spokesman said that the Japanese automaker aims to start deliveries of its Leaf electric car in Europe starting in December. The Ampera plug-in hybrid from General Motors Co. UK subsidiary Vauxhall also should arrive in time to benefit from the subsidy as long as its planned 2011 debut remains on track. German sister brand Opel will get a version of the Ampera, which is based on the Chevrolet Volt that GM plans to launch in the United States later this year. In addition to the 230 million pound car grant fund, the government also plans to spend 30 million pounds on a network of electric vehicle hubs, called Plugged-In Places, in park garages, supermarkets and selected streets. London, Milton Keynes and the northeast of England will get the first recharging points -- with a total of 11,000 to be set up in the next three years in those areas. The program is a key part of Britain's efforts to cut emissions of climate-warming carbon from transport, which accounts for about a fifth of the country's total emissions. Recharging electric vehicles overnight is also expected to help use up any excess electricity produced by the thousands of wind turbines that the government wants to be built over the next decade.